2D seismic cross-sections calibrated to exploration wells allow highlighting the structural styles along a structural transect from the N–S axis, west of the Bouthadi–Chorbane anticline to the foreland, with a major regional tectonic anomaly striking roughly E–W along the subsurface Atlas front of the foreland basin. The interpretation of structural data and seismic profiles allow deciphering clearly the occurrence of Late Cretaceous–Paleogene inversion structures, accounting for folds detached along the basal intra-Triassic salt decollement level. These contractional structures in part result from the Middle–Late Eocene compressional events, which induced the first strong positive inversion in both the Atlas domain and adjacent foreland. The growth of these positive structures is outlined by angular unconformities, sedimentary gaps, and differential subsidence within the Paleogene deposits. The foreland area is characterized by a thick-skinned tectonic inversion style, where the Pre-Triassic basement is decoupled from its Jurassic–Quaternary sedimentary cover by a general decollement level located at the Upper Triassic/Lower Jurassic interface. The deformation features imaged by seismic sections are in agreement with such thick-skinned style controlled by deep-seated faults presumably inherited from the Pan-African basement. A regional structural cross-section is presented and discussed, crossing the N–S axis and outcrops of the South Atlas Front in the west and, then, running through the major structural anomaly of Chorbane and the foreland basin to the east. This regional cross-section has been also balanced and restored to its initial and intermediate geometries, i.e., after the Tethyan and Cretaceous extensional events and Paleogene compressional events, thus documenting the major tectonic anomaly of Bouthadi–Chorbane in the foreland as well as the overall structural evolution of the Atlas fold and thrust belt. 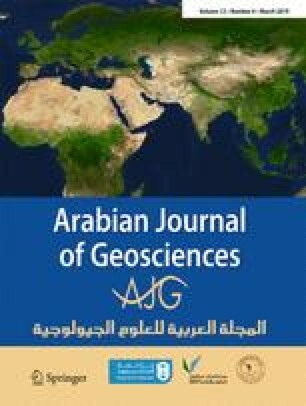 This article is part of the Topical Collection on Geology of North Africa and Mediterranean Regions. The authors wish to thank the guest editor Prof. Francois Roure for the constructive comments, suggestions, and corrections. The authors also thank the anonymous reviewers for their comments which helped to improve the work.